The plaque commemorates the 50th anniversary of the APEX organisation. 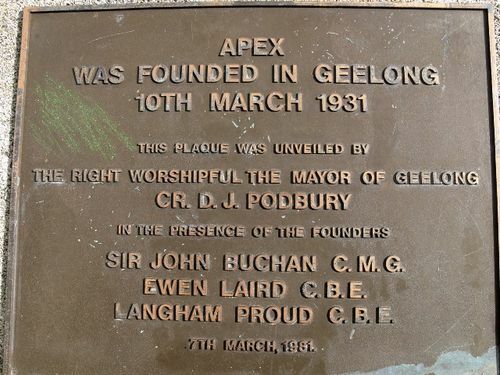 The first Apex Club was formed at Geelong in 1931 when three architects attempted to join the Rotary Club of Geelong. As Rotary has a rule restricting one profession to each club, the three architects - Ewan Laird, Langham Proud and John Buchan went on to form The Young Businessmen's Club of Geelong. After clubs were formed at Ballarat and Camperdown, The Association of Apex Clubs was formed, and the three clubs branded as "Apex". An Apex club is a community service club, neither sectarian nor party political, that provides young civic minded people the opportunity to volunteer within the community and develop personally through club run schemes such as public speaking competitions. Club members are volunteers aged between 18 and 45.